The first half of the F-level work platforms for NASA’s Space Launch System (SLS) rocket arrived today at the Vehicle Assembly Building at the agency’s Kennedy Space Center in Florida. A total of 10 levels of new platforms, 20 platform halves altogether, will surround the SLS rocket and Orion spacecraft and provide access for testing and processing. The Ground Systems Development and Operations Program is overseeing upgrades and modifications to High Bay 3 to support processing of the SLS and Orion spacecraft. The first three sets of platforms, H, J and K, were delivered to the center last year. Inside the Payload Hazardous Servicing Facility at NASA’s Kennedy Space Center, former NASA astronaut Dan Tani, who now is senior director of Missions and Cargo Operations for Orbital ATK in Dulles, Virginia, participates in a press interview. In the background is the Cygnus spacecraft scheduled to deliver hardware and supplies to the International Space Station on the upcoming Orbital ATK Commercial Resupply Services-6 mission. While NASA astronaut Scott Kelly and his Russian colleague, cosmonaut Mikhail Kornienko, have returned to Earth after a year on the International Space Station, work goes on aboard the orbiting outpost. To keep supplies coming to the current ISS crew and those who soon will join them, an Orbital ATK Cygnus spacecraft is being prepared at NASA’s Kennedy Space Center in Florida. 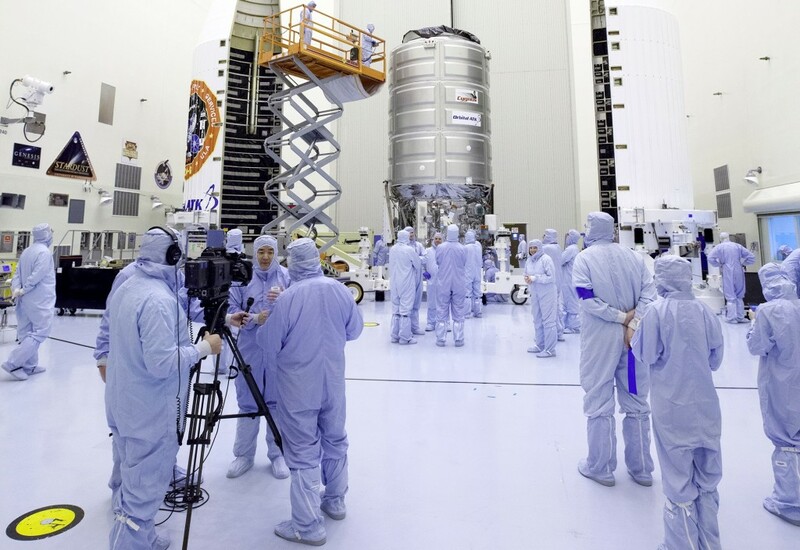 Members of the news media recently were given an opportunity to visit the spaceport’s Payload Hazardous Servicing Facility, or PHSF, where Cygnus is being prepared. The Orbital ATK Commercial Resupply Services-6 mission is scheduled for launch at 11:05 p.m. EDT on March 22 atop a United Launch Alliance Atlas V rocket. Liftoff will take place at Space Launch Complex 41 at Cape Canaveral Air Force Station. Former astronaut Dan Tani, now senior director of Missions and Cargo Operations for Orbital ATK in Dulles, Virginia, spoke about what he recalls about a resupply spacecraft arriving at the ISS. He was a member of the station’s Expedition 16 crew from October 2007 to February 2008. Orbital ATK uses the Cygnus to ferry provisions to the ISS under NASA’s Commercial Resupply Services contract. Cygnus consists of a pressurized cargo module for crew supplies, scientific experiments and equipment, together with an associated service module providing solar power and propulsion, to deliver approximately 7,700 pounds of cargo to the station. This mission will be the second flight of the enhanced variant of Orbital ATK’s Cygnus spacecraft. The upgraded cargo freighter features a greater payload capacity, new solar arrays and new fuel tanks. Cygnus’ pressurized cargo module has been extended and increases the spacecraft’s interior volume capacity by 25 percent, enabling more cargo to be delivered with each mission. According to Tani, Orbital ATK’s CRS-4 mission went so well, no significant changes were made for CRS-6. Tani explained that the astronauts aboard the orbiting outpost play a crucial role in commanding the spacecraft to get it into the right position so they can capture, or grapple, it with the station’s robotic arm. Plans call for the Cygnus spacecraft to remain attached to the station for about a month. Before undocking, the spacecraft will be loaded with several thousand pounds of trash prior to its destructive re-entry into Earth’s atmosphere. The second half of a new work platform was lifted and installed March 7 in High Bay 3 inside the Vehicle Assembly Building (VAB) at NASA’s Kennedy Space Center in Florida. The newly installed platform is the first of 10 new work platform levels that will provide access to NASA’s Space Launch System (SLS) rocket and Orion spacecraft for Exploration Mission-1. During the installation process, an overhead crane that can hold as much as 250 tons was used to lift the second half of the K-level work platforms up from High Bay 4, move across the transfer aisle, and lower it into High Bay 3. The platform was secured into position, about 86 feet above the VAB floor, or nearly nine stories high. The K-level platforms will provide access to the SLS core stage and solid rocket boosters during processing and stacking operations on the mobile launcher. A total of 10 levels of new platforms – 20 platform halves altogether – will surround the SLS rocket and Orion spacecraft and provide access for testing and processing. The giant steel platforms, each measuring 38 feet long and 62 feet wide, will be attached to rail beams that will provide structural support and contain the drive mechanisms to move them in and out or up and down as needed. 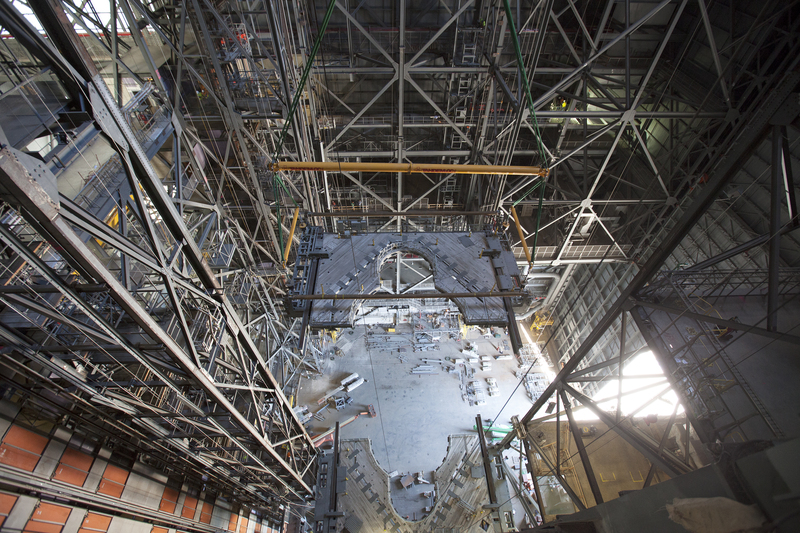 The Ground Systems Development and Operations Program is overseeing upgrades and modifications to the VAB, including installation of new work platforms, to prepare for NASA’s journey to Mars. More than five years of careful thought, in-depth planning and detailed refurbishments have set up Kennedy Space Center for diverse exploration missions that will push astronauts and robotic spacecraft into new areas of accomplishment, said, NASA’s Kennedy Space Center director, Bob Cabana at the National Space Club Florida Committee meeting today in Cape Canaveral. “We’re not just making a difference for Kennedy or even the nation, we’ve got a meaningful mission and we are making a difference for all of humankind,” Cabana, a former astronaut, told the group of about 375 in attendance. By focusing on piloted missions to the International Space Station using Commercial Crew Program spacecraft, followed by Space Launch System and Orion flight tests, Kennedy has established a ground support network of launch pads and associated infrastructure needed to support missions to Mars by astronauts in the future. All of this while maintaining the center’s unique ability to launch historic robotic exploration missions such as Osiris-Rex that will bring back a sample from an asteroid. Other flights in the future will continue to decipher the mysteries of Mars as well as taking close looks at other planetary networks in the solar system. The center has seen complete upgrades in many areas including the Launch Control Center, Launch Complex 39B and modifications to the Mobile Launcher tailored to the needs of the SLS rocket and Orion spacecraft. Other facilities have been upgraded for commercial partners. The center’s new headquarters campus is under construction to deliver an environmentally friendly, energy efficient structure. View Mr. Cabana’s complete presentation here. In the Space Shuttle Atlantis facility at the Kennedy Space Center’s visitor complex, center director Bob Cabana presents an update on activities at the Florida spaceport. 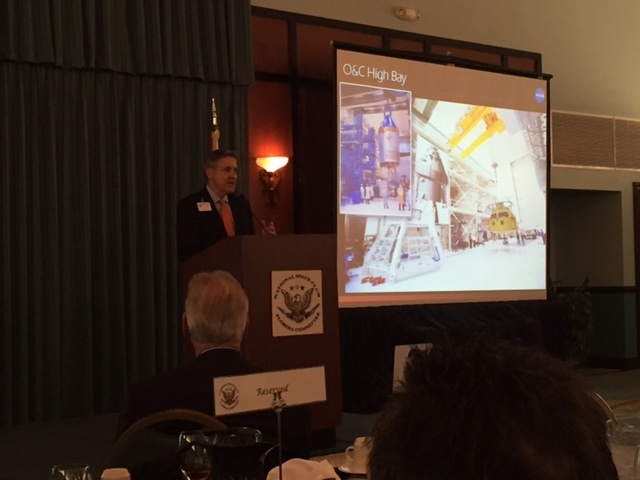 On March 1, Kennedy Space Center Director Bob Cabana presented an update on current and future activities at the Florida spaceport. 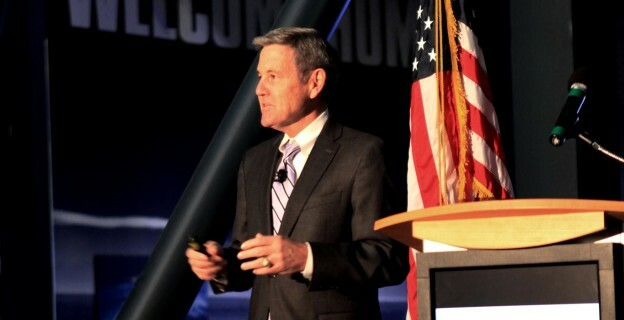 His report was part of the annual Center Director’s Update to community leaders, which took place in the Space Shuttle Atlantis facility at Kennedy’s visitor complex. The event was attended by local government representatives, along with individuals from business and industry. Cabana explained that the space center now is a 21st century, multi-user spaceport with a great deal of work going on in support of current and future space program initiatives. Speaking under the shuttle Atlantis, Cabana noted that the Florida spaceport’s main focus has evolved from a center focused primarily on flying a vehicle to utilize space close to Earth and exploring beyond Earth, to establishing a permanent presence in space. With crews living and working aboard the International Space Station since 2000, Cabana pointed out that a presence in space has already been established. Like a permanent presence in orbit, Cabana sees humans building ongoing outposts beyond Earth. Cabana referenced the many directorates at Kennedy that are supporting ongoing and future efforts. He then invited guests to speak with experts working displays explaining work at the space center. After the center director’s remarks, guests visited exhibits which featured the Center Planning and Development directorate, the Commercial Crew Program, Ground Systems Development and Operations Program, Exploration Research and Technology Directorate, the Launch Services Program, the International Space Station Program, and the center’s hands-on development environment for innovation, the Swamp Works lab. The area around the Vehicle Assembly Building is clearly visible in the center of the image. Launch Pads 39A and B are in the upper right. 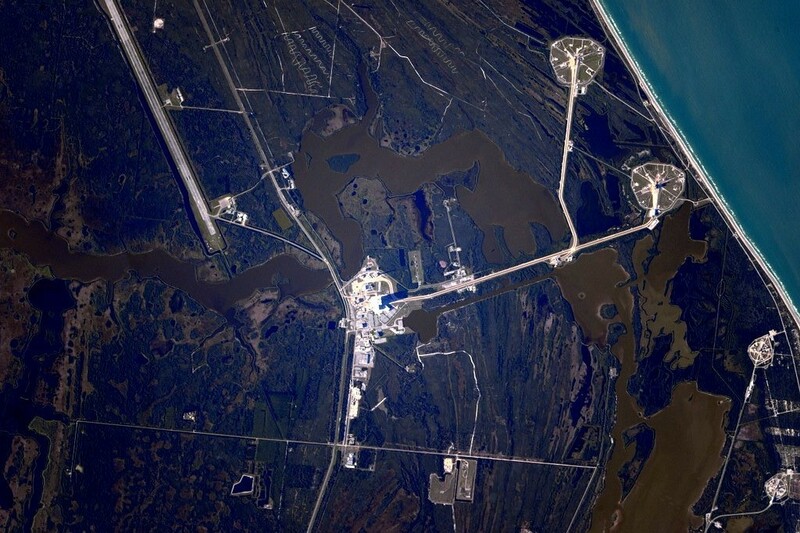 In the lower right are Launch Pads 40 and 41 at Cape Canaveral Air Force Station. In the upper left is the Shuttle Landing Facility operated by Space Florida at Kennedy. 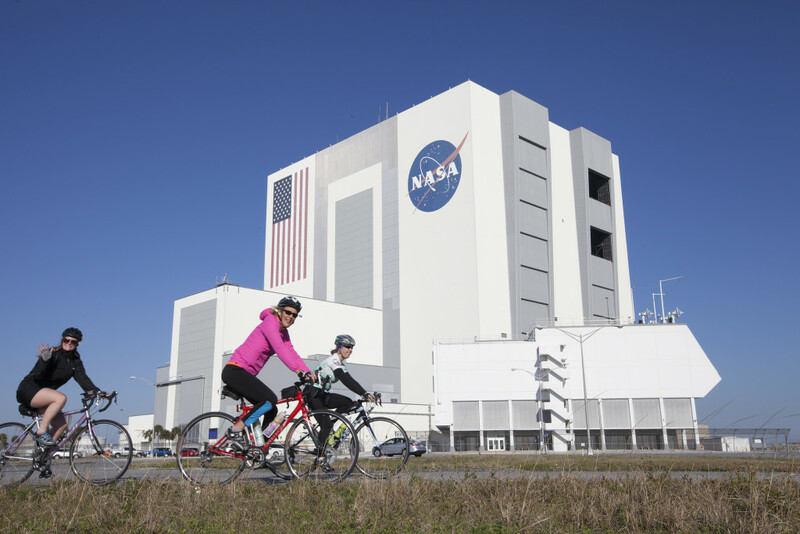 A trio of cyclists, smiling despite the early morning chill, rides past the Vehicle Assembly Building, or VAB, and Launch Control Center during the annual Tour de KSC bicycle tour. More than 650 employees and their guests came out to NASA’s Kennedy Space Center on Feb. 27 to tour the multiuser spaceport, choosing from three different routes of varying length. 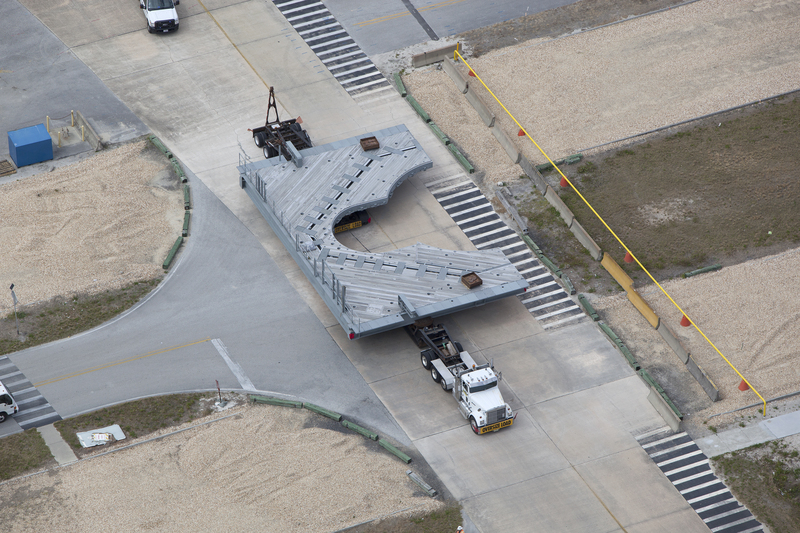 Routes had unique photo stops in addition to the VAB, such as Launch Pad 39A, Kennedy Space Center Visitor Complex and more, giving riders the opportunity to see the spaceport firsthand.